Getting to know your Welsh Rarebit. Welsh rarebit or Welsh rabbit is a dish made with a savoury sauce of melted cheese and various other ingredients and served hot, after being poured over slices (or other pieces) of toasted bread. Or the hot cheese sauce may be served in a bowl accompanied by sliced, toasted bread. Welsh rarebit is typically made with Cheddar cheese, in contrast to the Continental European fondue which classically depends on Swiss cheeses. Various recipes for Welsh rarebit include the addition of ale, mustard, ground cayenne pepper or ground paprika and Worcestershire sauce. Its origin lies in Wales and stretches back hundreds of years. It has very little to do with rabbit as the name suggests, much in the way that Toad in the Hole contains virtually no toad. It might have something to do with a lack of poachable rabbits for a dish. And instead, cheese becomes a tasty base for this toasty wonderment. 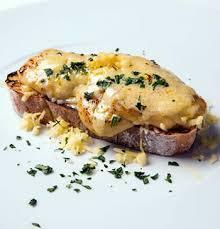 However Cheese on Toast it is not, and purists will turn purple at the thought of confusing the two! In a small saucepan, melt the butter and add the flour. Stir and cook for one minute. Whisk in beer, a little at a time, until you have a thick and smooth sauce. Add cheese, mustard and Worcestershire sauce. Season with salt and pepper. Toast bread under a grill on both sides. Spread sauce over bread making sure all edges are covered. Grill until bubbling and golden brown.